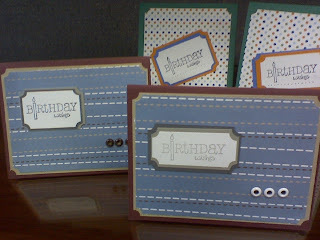 Create Embellish Adore: Its Birthday time! So there are few birthdays arriving shortly... mine among the list, but I needed to get restocked at work, and at home. I needed some masculine type cards, and think I hit that with the design and the colors. Nothing out of the ordinary but Birthday cards for men! 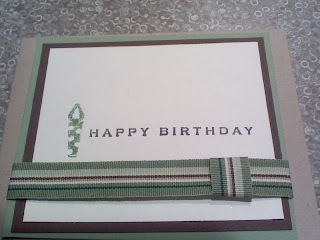 I loved this ribbon - I love this ribbon so much I didn't want to use for anything but a masculine birthday card. I didn't know how I was going to incorporate the ribbon, but I like the way it turned out. Simple and basic, but yet, makes a masculine statement. I really am to be working on a 50th birthday card for a friend in UK. I do not have the layout, or design or colors yet that I want... I mean, its her 50th birthday.... a big milestone... but as with everything else.. she's a simple gal.